This is a small cove between L’Almadrava and Canyelles. It is only 100 metres long, but it has all the charm of a sheltered cove with clean, crystalline waters. Coastal surveillance, sand and water cleaning, floating platform, floating mooring for boats, waste-paper bins, drink and ice-cream stand, with tables and sunshades. 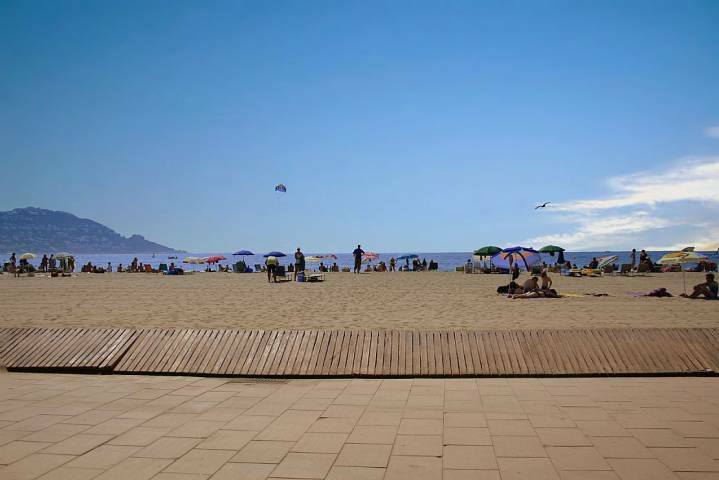 The La Punta beach is right in Roses town centre. It is a 550-metre beach with very fine-grain sand and shallow and transparent water, ideal for families. It runs from the fishing port to the mouth of the Ginjolers stream. Year after year since 1996 it has been awarded the European Union’s Blue Flag. Coastal and land surveillance, showers, waste-paper bins, toilets, Red Cross first-aid post, telephones, good signposting, ramp for the disabled, restaurants, drink and ice-cream stands, lounger beds, sunshades, awnings, pedalo and kayak rental, volleyball net, children’s play area and zone for easy parking without attendant. A beach 450 metres long, with fine sand and turquoise-blue water. 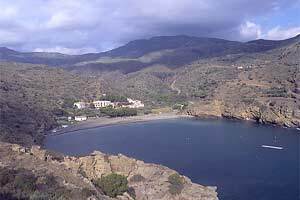 It is five kilometres from Roses, along the road that runs from the lighthouse to Falconera point. It is sheltered from the North wind, which makes it very popular with bathers. Apart from the year 1993, ever since 1992 it has been awarded the Blue Flag by the European Union for the quality of its waters and services. Coastal and land surveillance, showers, waste-paper bins, toilets, Red Cross first-aid post, telephones, good signposting, ramp for the disabled, restaurants, drink and ice-cream stands, lounger beds, sunshades, awnings, pedalo and kayak rental, volleyball net, boat anchoring zone and zone for easy parking without attendant. 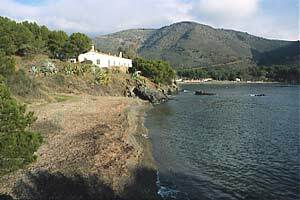 Roses’ main beach, divided into three sectors: Nova beach, Rastrell beach and Salatar beach, each one separated from the next by a stream. It has a total length of 1,790 metres and runs from the mouth of the Ginjolers stream to Santa Margarida beach. It is a very broad and much-used beach, with fine-grain sand and shallow waters ideal for families and for engaging in water sports. Ever since 1994 it has been awarded the European Union’s Blue Flag for the quality of its waters, sand and the services available to visitors. Coastal and land surveillance, showers, waste-paper bins, toilets, Red Cross first-aid post, telephones, good signposting, ramps for the disabled, restaurants, drink and ice-cream stands, lounger beds, sunshades, awnings, pedalo and kayak rental, volleyball net, children’s play area, windsurfing school and zone for easy parking without attendant. This runs from Salatar beach up to the outlet of Santa Margarida residential marina. It is a long (some 650 metres) and broad beach with fine-grain, golden sand and clean and shallow waters. 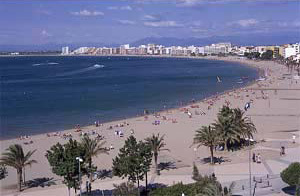 It is a beach used by a goodly number of foreigners, many of whom have second homes in the area. The Santa Margarida residential estate is a first-rate tourist centre, made up of a marina with over 16 kilometres of navigable canals and a peerless range of accommodation (hotels, camp sites and apartments), together with a varied choice of cuisine, shops, leisure activities and an intense night life. This runs from Salatar beach up to the outlet of Santa Margarida residential marina. It is a long (some 650 metres) and broad beach with fine-grain, golden sand and clean and shallow waters. It is a beach used by a goodly number of foreigners, many of whom have second homes in the area. 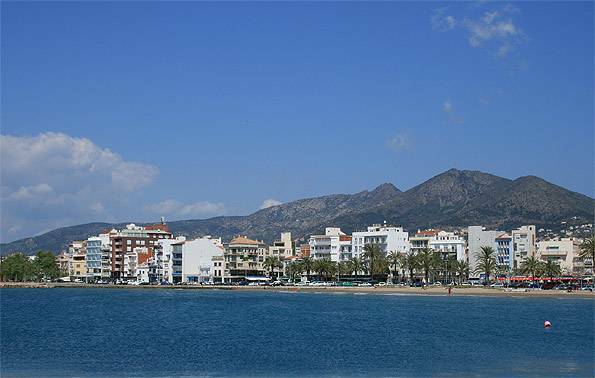 The Santa Margarida residential estate is a first-rate tourist centre, made up of a marina with over 16 kilometres of navigable canals and a peerless range of accommodation (hotels, camp sites and apartments), together with a varied choice of cuisine, shops, leisure activities and an intense night life. Coastal and land surveillance, showers, waste-paper bins, toilets, Red Cross first-aid post, telephones, good signposting, ramps for the disabled, restaurants, drink and ice-cream stands, lounger beds, sunshades, awnings, pedalo and kayak rental, volleyball net, children’s play area, windsurfing and underwater diving school and zone for easy access and parking. One kilometre from Roses town centre, just beneath the road to the lighthouse. It is a small 140-metre beach with fine-grain sand and with sand and rock seabed. It has always enjoyed considerable popularity amongst Roses dwellers, for behind the beach there is a small picnic zone under the shade of the tamarisk trees with stone benches and tables and a fountain. Coastal surveillance, sand and water cleaning, waste-paper bins, showers, telephone, drink and ice-cream stand with tables and sunshades and a large parking zone with no attendant. This is a little cove with a 110-metre beach surrounded by cliffs and with transparent waters. 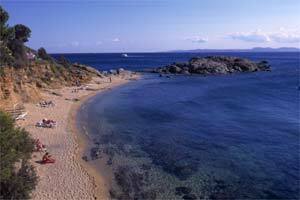 It is 8 kilometres from Roses, between Pelosa and Montjoi coves. Access is via the same road running along the coast and going on to beyond Cape Nofeu. It is a cove with medium-grain, grey sand. The beach shelves rapidly into deep waters. 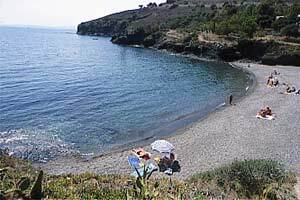 Coastal surveillance, buoy-marked bathing zone and cleaning of the cove and its waters. Between Montjoi cove and Rostella cove, this is a short (50-metre) beach with medium-grain sand. Some consider it to be a small prolongation of Montjoi cove, for all that separates them are some rocks that jut out of the sea. Coastal surveillance, buoy-marked bathing zone, containers at the cove exit, parking zone without attendant and beach and water cleaning. This is an unspoiled cove with a wild landscape backdrop, running for a length of some 190 metres and located 12 kilometres from Roses town centre. 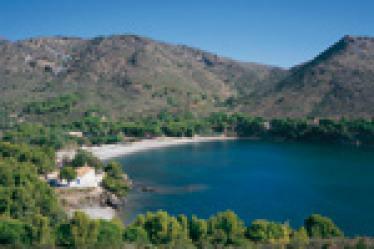 Access is by a coast road running along the entire coastline, passing by Cape Norfeu and ending at Jòncols cove. This is a beach formed by pebbles, also to be found on the steeply shelving seabed. This is an ideal spot for diving (with a specialised centre). Coastal surveillance, buoy-marked bathing zone, car park without attendant, sand and water cleaning service during the summer season. It also has rubbish containers at the exit from the cove, signposts, a beaching point for tourist boats, a terrace with reed sunshades and a removable jetty. Seven kilometres from Roses, between Calitjàs and Calís coves. It is a broad, much-visited cove, running 270 metres in length, ideal for underwater diving (with a specialised centre). It has coarse sand and pebbles, and the seabed shelves steeply. 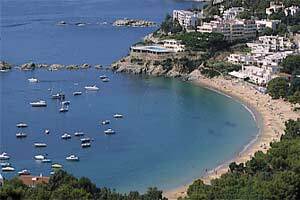 There is a holiday village here and the famous El Bulli restaurant, considered one of the most select in the world and awarded three stars in the Michelin guide. Coastal surveillance, buoy-marked bathing zone, beach and water cleaning, containers at the cove exit, large parking zone without attendant, tourist boat beaching area, service for skates and lounger beds, terrace with tables and sunshades, removable jetty and a bar.